While I was triaging 7 weeks of snailmail on Thursday, I found a chunky package wrapped in white paper (rather than an envelope) with my name and address scribbled on it. 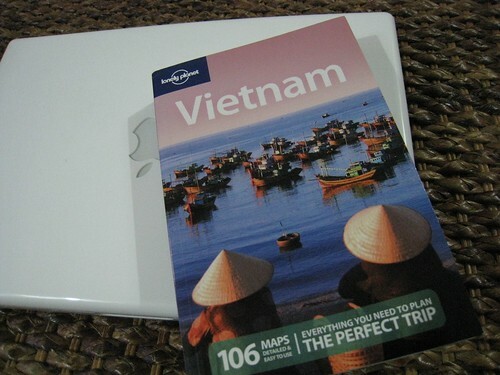 I ripped it open as if it were a gift, and it practically was, because the package turned out to be the new 10th edition of the Lonely Planet guidebook to Vietnam. Of which I wrote three destination chapters: North-Central Vietnam, Central Vietnam and Central Highlands. If you're interested in glorious landscapes, history, the American War in Vietnam, minority groups and cool weather, those are the chapters you'll wanna read first. Suzie: how chuffed are you! The book doesn't hit stores till July, so if you were planning to pick up a guidebook to Vietnam in the next couple of weeks, hold your horses till you see this one. The new edition has a cover photo with conical hats (predictable, I know) and basket boats on a river. Or buy it here at LP.com. Meanwhile, I'm toting my first copy around in a protective Ziploc bag, to show to all and sundry. As I was saying, I love going, "My friend, who's an LP writer..."
I'll be putting it on my Chapters/Indigo wish list and maybe in the future, getting an autograph too...congratulations. Come come come, do Bangladesh next! Congratulations! My sis is in Vietnam all the time. I'll tell her to buy like 10 copies. Yay yay yay! Deservedly chuffed.